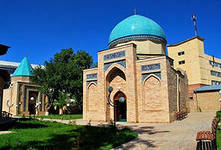 Sheykhantaur Mausoleum (Sheikh Hovendi at- Takhur) is one of the most important architectural monuments of Tashkent. Memorial Hovendi at-Takhur was built at the end of the XIV century by order of Amir Temur. The appearance of the mausoleum was repeatedly changed. It is modest building of brick with a small tympanum decorated with blue majolica. The building is divided into two rooms, one of which is topped by a dome, as well as it is a protection of at-Takhur’s grave. The second one is built over the graves of his wife and son of Sufi. Sheikh Havendi at-Tahur was deeply honored not only among his contemporaries, but also future generations. When he was youth, he traveled to Turkestan, where he lived for several years in dervish khanaka, learning the mystical philosophy of Ahmad Yassavi. Arriving in Tashkent, he lived not far from the holy spring, where he was buried in 1355. Here you could see millennial trees until recently, one of which is survived in Sheihantaur Mausoleum.